In "No Man is an Island" Hamish sails to an Island where he meets Belle Carter on the beach. 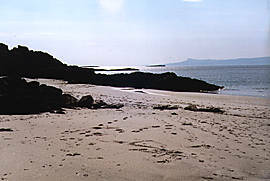 The location used for the beach is at Camusdarach near Mallaig. The final part of the journey to this location is over some of the worst 'main road' on mainland Scotland. The section before Arisaig constantly changes from two way to single track road (usually on blind bends). Alternatively if you prefer an shorter, easier but more expensive journey you can cross to Skye via Kyle, A850 and then A851 to Armadale, and take the ferry back the mainland at Mallaig from where the beach is only a few miles away. If staying on the mainland go from Plockton to Fort William. Then A830 to Arisaig. Continue for five miles until you pass the sign for Camusdarach camping site on the left side of the road. Just past this, there is a sign reading car park 100 yards. Pull into the carpark which is on the left hand side of the road at the bottom of the hill. Unfortunately the easy access to the beach is over private ground next to the car park which currently has large Private Property, No access signs. There is however public access to the beach which was used as the location of Ben's Beach in the film "Local Hero" which Jimmy Yuill who played Lachlan Macrae in the first series of Hamish Macbeth appeared in. From the car park follow the signpost to the beach. Hamish Macbeth is seen burning his boat at the beginning of the episode in front of some rocky islands. To reach this point go to the opposite end of the beach to the path from the carpark and around the small headland to the next beach. If the tide is out you can walk round on the sand, in the tide is in you will have to go over the rocky headland. 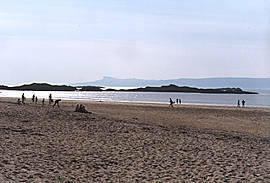 The rest of the beach scenes were filmed at a neighbouring beach. There is little difference in the views from the public beach and that used for the location in Hamish Macbeth both of which have fine views across to the Islands of Eigg, Rhum and Skye. But if you want to go to the actual location you can follow the directions below. Go back down the beach to where the path from the car park joins the beach. If the tide is out it is possible to cross the stream on the right as you get onto the beach, go up some rocks and walk round the headland of Rubh'an Achaidh Mhóir to the beach used in Hamish Macbeth. This does involve going over some private property and it is up to you whether you wish to do this. Once up the rocks (an easy climb) go along by their edge next to the fence. After a hundred yards or so you will need to cross an old metal fence which blocks acesss to the headland. It is on this headland that Hamish Macbeth is seen walking with Alex at the beginning of the episode and also where he tells the seagulls it's feeding time. Once past the headland there is a faint footpath which carries on round the headland from where you can get down to a beach. Walk along the first sandy beach you reach and then over some sharp rocks to reach another smaller beach where most of the action takes place. The island seen right at the beginning of this episode was near Barra in the Outer Hebrides. Some of the scenes of Hamish Macbeth walking up a headland after Alex is seen saying "Hamish Macbeth, Are you stupid?" were also filmed here.